Japan started its “lost decade” in the 1990s. Now their lost decade has dragged into three lost decades. The U.S. began its first lost decade in 2009 and is now entering its second lost decade with no end in sight. What I referred to in 2014 and what El-Erian refers to today is that central bank policy in both countries has been completely ineffective at restoring long-term trend growth or solving the steady accumulation of unsustainable debt. In Japan this problem began in the 1990s, and in the U.S. the problem began in 2009, but it’s the same problem with no clear solution. The irony is that in the early 2000s, former Fed Chair Ben Bernanke routinely criticized the Japanese for their inability to escape from recession, deflation and slow growth. When the U.S. recession began during the global financial crisis of 2008, Bernanke promised that he would not make the same mistakes the Japanese made in the 1990s. Instead, he made every mistake the Japanese made, and the U.S. is stuck in the same place and will remain there until the Fed wakes up to its problems. Bernanke thought that low interest rates and massive money printing would lead to lending and spending that would restore trend growth to 3.2% or higher. But he ignored the role of velocity (speed of money turnover) and the unwillingness of banks to lend or individuals to borrow. When that happens, the Fed is pushing on a string — printing money with no result except asset bubbles. The bottom line is that this extravaganza of zero rates and money printing worked to ease the panic and prop up the financial system. But it did nothing to restore growth to its long-term trend or to improve personal income at a pace that usually occurs in an economic expansion. Until they do, the next recession may be impossible to get out of. The odds of avoiding a recession until the Fed normalizes are low. In the meantime, get ready for more disinflation (or deflation) and slow growth. The central banks are stuck and there’s no way out. They cannot escape the corner they have painted themselves into. 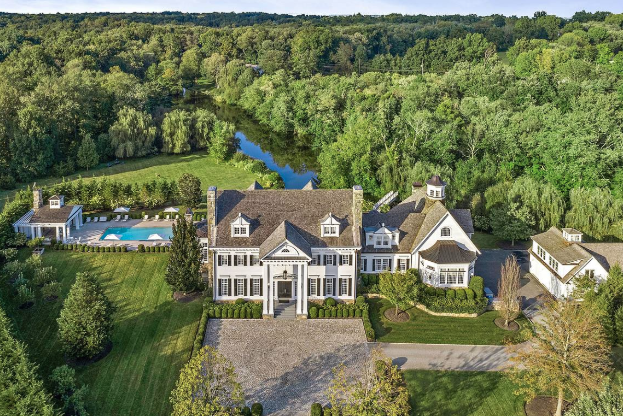 Houses in the exclusive Connecticut suburb of Greenwich, long known as an enclave for hedge fund managers, are now selling for significantly less lately, with one recent colonial house forced to the auction block. 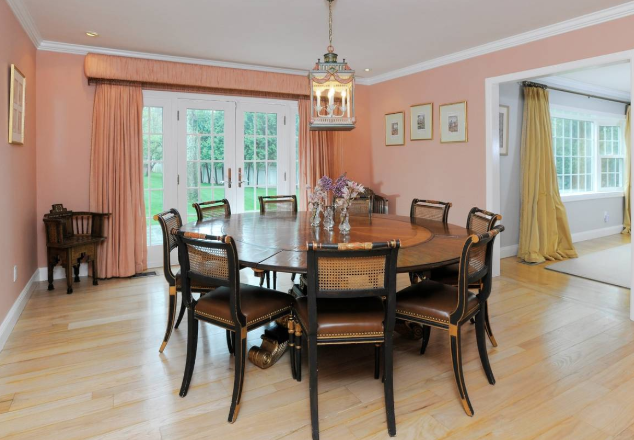 The property, located on the iconic Round Hill Road, is being sold in what would normally be unthinkable fashion for Greenwich: it’s being auctioned. It’s price tag used to be $3.795 million, but now the four-bedroom property will be sold for its reserve price of just $1.8 million, according to the Wall Street Journal. Its seller, Isaac Hakim, was faced with a grim buyer strike reality and said it was time to move on. “We are ready to sell and I don’t want it to drag on,” he told the WSJ. Where is Hakim rushing to? Why Florida of course. 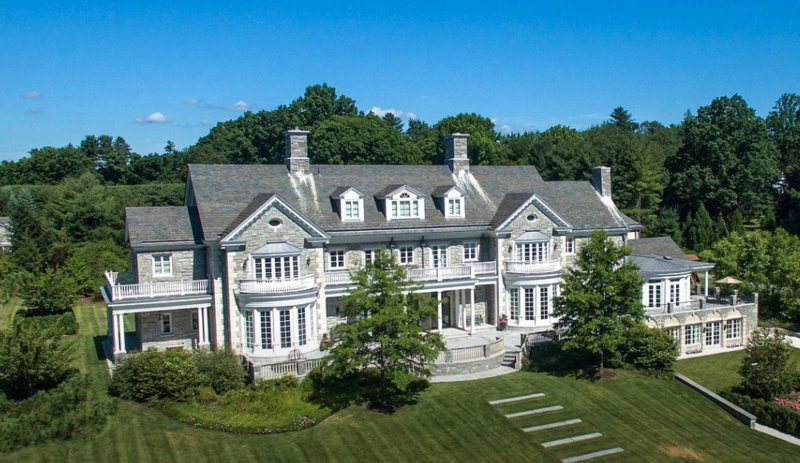 While these types of luxury home auctions frequently happen in other parts of the country, it’s rarely seen in a market like Greenwich which used to be a beacon for top players on Wall Street and still remains one of the richest towns in the United States. But Greenwich now faces new challenges, as New Yorkers opt to live in the city and even some, like Hakim, relocating to Florida in search of a favorable tax environment. The bonuses that were used to prop up the real estate market from bankers are also starting to run dry while SALT limitations make owning a luxury house increasingly prohibitive. This has forced a sharp repricing of the local real estate market as sellers are starting to accept less and owners that paid top dollar for their homes in the 2000s are embracing the need to make concessions if they want to sell. There were 45 properties in Greenwich priced at more than $5 million that had their prices reduced by 10% or more in the 12 months between April 2018 and March 2019. Some sellers have even resorted to renting out their homes. Brian Amen, an agent at Houlihan Lawrence, said one of his clients tried to sell his $3.65 million home for about a year, then lowered the price, and then decided just to lease it out in hopes that the market would improve down the road. Other prominent owners have taken far less for their house than they paid. Iconic music executive Tommy Mottola sold his house for $14.875 million, or 25% of its original asking price. And hedge fund executive Ara D. Cohen sold his property for $17.5 million – half of what he was looking to get in 2015. The auctioning off of homes is likely to not help sentiment for projects in the area. In 2016, Starwood CEO Barry Sternlicht called Greenwich the worst housing market in the country. “You can’t give away a house in Greenwich,” he said. In retrospect he may have been right. Robin may want to take a look at these stats: the median price for a home in Greenwich dropped by an astounding 16.7% last year to $1.5 million in the fourth quarter of 2018. On the luxury end of the market, including the top 10% of sales, prices dropped even further by 18.8%. That trend has continued into the first quarter with estimates at median prices falling more than 25%. The worst is yet to come, however, as the average time a luxury house sits on the market in Greenwich is 357 days from its most recent price adjustment, and as sellers become discourages, they will likely take even bigger discounts to sell their houses. Somewhat surprisingly, the only segment of the market that’s performing well are smaller entry level homes that are close to the train station, which are being snapped up by a younger generation of buyers. Low price condos in the area now start at just $330,000. The expansionary phase of the global economy is almost certainly ending. A combination of excessive debt and trade protectionism is likely to become economically and politically destabilising. If, as seems increasingly likely, the world is destined for another credit and economic crisis, the colour of the political establishment will shape outcomes. This article examines the political scene and concludes that socialist puppet-masters will use the opportunity in an attempt to crush capitalism. In 1975, I watched from the Strangers’ Gallery the debate in the House of Commons when the Referendum Act for membership of the Common Market was in its second reading. It was to be the first referendum ever held in the UK, and as one would imagine was contentious for that reason. The Labour government of the day had laid an act before Parliament for a referendum to ratify the European Communities Act of 1972, in other words, the UK’s membership of the Common Market. The debate was not about membership, but the precedent of holding a referendum and its potential to undermine parliament’s sole right to take decisions on behalf of the people. In those days, MPs made proper speeches, not the time-limited five or so minutes permitted by Mr Speaker. A debate of this sort was worth listening to. I was struck by the similarities of argument put forward by the two greatest parliamentary orators of the day. Michael Foot was the doyen of the extreme left in the Labour Party, and Enoch Powell was said to be on the extreme right (he wasn’t – he was a staunch free marketeer: more on this to follow). From their different perspectives their arguments were almost identical, and both spoke eloquently without notes. Foot had a distinctive style we see less of nowadays. He was an old-fashioned socialist rabble-rouser, with his arguments and timing honed to perfection on the hustings. His was the traditional Labour campaigning style; a throw-back to pre-war socialist tub-thumping. He was, at that time, the best exponent of this type of oratory in Parliament, made all the more credible by his unwavering belief in the Marxist cause. Powell’s style was the epitome of classical oratory. Measured. Complex. Spell-binding. Faultless in delivery. He was the Cicero of our day, and you could imagine him declaiming in the Roman senate. Powell had one of the most brilliant intellects of his generation. He excelled in the classics, both as a full professor when only twenty-five and as an author. As a soldier in the Second World War, he was one of only two men who rose from the ranks as a private to Brigadier. As well as Ancient Greek and Latin, he was fluent in Welsh, German and Urdu, and later in several other languages. He was a man of unbending principle, believing in classical economics: the virtues of free markets and sound money. A truly remarkable, single-minded man. In 1975 his problem was political baggage. In 1968 he had made a speech prophesying that uncontrolled immigration would cause social strife. “Like the Roman, I seem to see the River Tiber foaming with much blood”. His speech scandalised the socialist establishment and the Conservative politicians of the day, which under Macmillan followed a policy of compromise and appeasement with socialism. With this speech Powell attracted unwelcome attention and adoration from fascistic socialists and other groups described as being on the far right. His political ambitions were damned by the company he had attracted. Powell’s other political handicap in those appeasing times was his stubborn refusal to compromise, which must not be confused with being “right wing”. The political reality was and still is that a politician could be a non-compromising socialist but not a non-compromising free-marketeer. Powell was side-lined, but he remained a very powerful orator from the backbenches, stylistically different, a lonely defender of free markets and sound money, but the only match for Foot’s oratorical abilities. Powell was essentially the victim of the socialist tactic of seizing the agenda and controlling debate by disparaging all opposition. Before the War, the communists took the moral high ground and vilified the fascists, an easy target when German-Jewish refugees were desperately escaping from the Nazis. Subsequently, the defeat of fascism in Europe exposed the full horrors of Hitler’s regime. At the same time, the horrors of Marxist-socialism in the USSR remained concealed from the public behind a wall of communist propaganda and disinformation, which was widely trusted. With the ending of German and Italian fascism, they were no longer a political target. Marxists in Europe simply rebranded capitalism as fascist. Through ignorance, habit or mendacity, the electorate were led to believe that free-marketeers, such as Powell and then later on Margaret Thatcher, were right-wing extremists. Centrist politicians still fall for this Marxist line. Last week, Ken Clarke, the Father of the House of Commons (the longest-standing MP) and Conservative ex-Chancellor from the 1990s, described the European Research Group in his own party as on the right of the party. As a matter of fact, the ERG supports free markets with minimal government interference. By definition, its economic policies are therefore devoid of political bias. Clark is wrong and should know better. Marxism has always sought to overturn free markets. Marx invented the term Capitalism and the manufacturers of goods and services were then labelled Capitalists. They were terms of derision deliberately applied to those who toil for profit. In socialist France today, profit is everywhere a dirty word, and it is not much better elsewhere in Europe. Free-marketeers have little or no voice in politics, having nothing to do with the socialist creeds upon which politicians are elected. In the wake of Brexit, it was the re-emergence of the debate about Britain’s membership of the EU that has exposed once again the extent of the leftward drift into socialism by the political class. That today a senior Conservative, which is nominally the party of free markets, fails to understand the important distinction between the fascist socialists, who rallied behind Powell’s rivers of blood speech, and the ERG’s free marketeers, is evidence of how mud sticks. It is an ignorance that has become ubiquitous. Ken Clarke is certainly not alone in failing to understand that free markets are apolitical. Furthermore, with his fellow Remainers he is an interventionist, which means he is a socialising politician, otherwise defined as a socialist. A socialist is a person who supports political intervention, the redistribution of social capital for the purpose of a supposedly greater good. Clarke appears to believe that the greater good can best be pursued through even grander state organisation than Westminster alone, and by intervention on a pan-European scale. In European terms, Clark would probably describe himself as a social democrat, perhaps without fully understanding the philosophical conflict in the phrase. There is a certain tension in the phrase, “social democracy”, and the description of someone as a social democrat. Social in this context is socialism by the state. A democrat supports the freedom for individual electors to express and defend personal interests in regular plebiscites. The two positions are incompatible. At this point we should note that in economic terms there is little philosophical difference between European socialism and communism. Both seek to relieve capitalists of the means of production in favour of the state, either by ownership or control. Marx himself saw socialism as a temporary phase on the way to full communism. However, we all know from experience that communism fails by impoverishing everyone other than a coterie of leaders. The same problem of the state’s inability to calculate prices, other than with reference to labour costs, and to foresee what consumers require on the morrow bedevils both socialism and communism. The principal difference between the two is the speed at which economic disintegration takes place, tied to the rate at which the socialising state removes personal freedoms and destroys wealth. Social democrats assume that moderate socialism does not lead to those outcomes, which is a mistake. They are deceived. With social democracy we observe committed socialists and communists using democracy as the pathway towards increasing socialism and eventual communism. But there’s a problem, which in time becomes increasingly obvious to the electorate. Electors become poorer over time, and the more progressive amongst them seek to escape in order to participate in more capitalistic economies. Lenin and Mao Zedong dealt with this tendency by suppressing all freedom of expression and they redefined democracy to permit only the election of communist officials. Intellectuals, always the first to express discontent, were liquidated or sent to the Soviet gulags and China’s penal labour camps. In Western Europe a different, more patient approach was needed for the communist revolution. And this is where the concept of the social democrat springs from. The tactic was (and still is) to stand firm on socialism and force compromises always to be made by the democrats. For decades it was the basis of Soviet foreign policy, which employed “useful idiots” to spread communism in both universities and political circles. Their influence was what defeated Enoch Powell and still drives Ken Clarke and his fellow appeasers towards greater socialism. It is clear that social democratic politicians need not be communists, only appeasers. Social democratic political parties express a belief in social justice. But social justice is a meaningless term used by the far left to attract support for more extreme forms of socialism. In Europe, social democrats advocating social justice have held sway since the Second World War. But they are becoming victims of their success at taking down capitalism, because they are losing electoral support. The era of social democracy appears to be coming to an end. Germany’s SPD recently suffered its worst electoral result since the Second World War, and France’s Socialist Party came fifth in the presidential election won by Emmanuel Macron, a political outsider. Other social democratic parties to have lost ground include the Netherlands’ Labour Party, Italy’s Democratic Party and Austria’s Social Democrats. In the United States there was a rejection of the Democrats in favour of President Trump, who like Macron in France started as a political outsider. Brexit was the rejection by the British voter of the socialising controls imposed by a remote super-state. The British parliament initially paid lip-service to the electorate’s wishes, before rallying round its socialist credentials and is now conspiring to stop Brexit. So strong is Parliament’s collective socialist instinct that May’s appeasing government is prepared to destroy its electoral base rather than stand against the socialist tide. It comes at a time when the Labour Party has been captured by a Marxist clique which appears increasingly likely to form the next government. Commentators attribute the decline in social democracy to events such as the great financial crisis. This and other reasons are why traditional working-class and blue-collar workers have drifted away. The philosophical conflict between socialism and democracy is at the heart of the rebellion, if only the voters themselves knew it. Instead of rejecting socialism, they are embracing extremes, and the extremes are always socialist extremes. Notably, almost none of the disillusioned social democrats support free markets. The point missed by most analysts is that social democracy is failing because of the contradiction between personal freedom and state control. As a form of mild socialism, it fails for the same reason as did communism. It all plays into the hands of the communists, for whom the failure of social democracy is an opportunity. They encourage the rank and file to blame capitalism. The collapse of capitalism is inevitable, as Marx wrote. And its collapse hastens full-blooded communism. Communism is a broken philosophy, as has been clearly demonstrated. But ruthless leaders still see it as the means of obtaining power over their fellow humans. Through the medium of social democracy, we have seen how Marxist communists have retained control of the political agenda in Europe and elsewhere. For Marxists, socialism is a temporary phase on the way to full communism, and socialism’s destruction of capitalism is expected, even planned. Marxists are confident they can move electoral support from moderate socialism to support a full revolution. In order to understand the implications of an electorate drifting to socialist extremes, we must examine the relationship between them. The principal socialist creeds are on the left Marxist communism and on the right fascism. Social democrats, sympathetic to Marxism, condemn fascism. Anything vaguely to do with fascism is seen to be beyond the pale, with leaders of right-wing parties ostracised from political life, and even jailed. What is not recognised are the remarkable similarities between fascism and communism. While few people realise the similarities between these two forms of socialism, fewer still realise that they are about as different as Marxism was to Trotskyism. The inventor of fascism, Benito Mussolini, started his political career as a leading member of the Italian Socialist Party, heading up the Bolshevik wing, purging moderates from the party. He was the Italian equivalent perhaps of Lenin. Before the First World War broke out, Italy’s communists split into two factions. One was Marxist, which condemned the war as a capitalist affair, hoping to see the capitalists kill each other. Its policy was agnostic, planning to agitate for a civil war to overthrow all remaining post-war capitalists. The other faction was nationalistic, driven by a traditional hatred of Austria. Mussolini stuck with the anti-war Marxists and became their leader. As the Austrian economist von Mises observed, no one could surpass Mussolini in his Marxist zeal, being an adversary of patriotism, nationalism, imperialism, monarchical rule and all religious creeds. He was the eloquent prophet of the socialist bliss to come. However, it soon became clear to Mussolini that in belligerent Italy the nationalists were in the ascendency, and his Marxist wing was losing support. He simply switched sides, joining the nationalist communists and advocated war against Austria. Probably more than anyone else, as a communist and influential journalist, he was responsible for Italy’s entry into the Great War on the side of the Allies. After the war, his star waned. The Marxist wing still attracted support, but with the war ended the nationalist faction lost its relevance. Mussolini simply switched once again, this time to set up an entirely new communist party. He coined the term fascist, which in its original objectives was as strongly anti-capitalistic as Marxism. Both Marxists and fascists believed in the absolute power of the state. Both believed in rule by a dictator. Both believed that private desires and interests must be suborned into the will of the people. Both demand self-sacrifice and obedience to the state. There were some differences, notably the fascist policy of corporatism. Corporatism was state control of labour and factory owners, instead of public ownership of the means of production. But in their economic effect there was no difference between corporatism and nationalisation. The common enemy was capitalism. In its later forms, Italian fascism moved closer to the German version, which had its origins in Bismarck’s German socialism. The closeness of the two creeds of fascism and communism was reflected in the brutalities and slaughter of millions common to both fascism and communism. The National Socialists of Germany went even further with racial elimination and eugenics, giving propaganda material to the Marxists. But in the Second world War, the philosophical link between these two forms of socialism led to the Molotov-Ribbentrop Pact of mutual non-aggression in the common fight against the capitalist Allies. This is why the key to understanding fascism is to understand it is a similar form of socialism, a rival to left-wing ideology but with the same objective. It has nothing in common with laissez-faire, which is apolitical. This article has described the political landscape in democratic countries being dominated by socialism, which acts as a Trojan horse for communism. The task of socialism is to destroy capitalism and pave the way for communism, be it Marxist or fascist. It is time to consider what happens when, inevitably and as planned, socialism collapses under its contradictions. It collapses because socialism robs the economy of resources and efficiency. The ultimate destruction comes through the debasement of state-issued currency to the point when it collapses entirely. There can be little doubt that many countries infected by social democracy face this eventual outcome. The build-up of unrepayable debt obligations takes them towards a general insolvency when the piper must be paid. Proper economists, not the social democratic imitations employed by or kowtowing to governments, know this. The cycle of credit expansion leads to times when a credit crisis is more likely to occur than at other times. The runes suggest we are getting close to that point. This being the case, we can expect a rash of economic and systemic failures indirectly due to socialism. Logically, we would expect these failures to be correctly attributed and a new movement towards free markets to follow. Those of us that have studied free markets know that a state that is brave enough to abandon all socialist intervention will see its population rapidly rewarded by a return to normality; a tough period perhaps of only a year or two. This optimism is clouded by the reality that more extreme socialism is seen by state establishments as the solution to all crises. The police and army will be tasked to maintain law and order, and rationing introduced along with price controls. We have seen it all before. There may be some states that edge back from the socialist brink, but the majority will instinctively turn towards Marxism, or perhaps in rare cases, fascism. The screw will be tightened even further on ordinary people and their families. Free markets are not the first option. Realistically, we should dismiss hopes of a rapid return to free markets, because nearly everyone is a socialist. The fortunes made on the back of credit expansion have their origin in socialism, the redistribution of wealth through currency debasement. In our financial affairs we pay lip service to capitalism. In reality those of us with financial and property assets have (so far) benefited from its gradual destruction. We are nearly all socialists now. The largest city in the United States is seeing its population decline for only the second time in the past ten years, according to federal estimates. International migration into New York City has slowed at the same time as more residents have departed, which has caused the city’s population to decline in both 2017 and 2018, according to the Wall Street Journal. The city’s population fell 0.47% compared with 2017, to 8.4 million – a number that was at odds with estimates. Census officials had estimated that New York’s population grew by about 7,000 in 2017, but revised figures show that it fell by about 39,000. New York City’s Department of City Planning officials said that the city’s population expansion of the last decade – one that saw residents in the five boroughs grow by 2.7% between 2010 to 2018 – has begun its “inevitable slowdown”. “You cannot maintain that level of growth forever,” city planing’s chief demographer Joseph Salvo commented. Net migration, measured as the sum of all people moving in and out of the city, has also fallen. In 2011, that figure grew by about 14,300, a reversal of a decade long downward trend. That number started falling again in 2013 and fell by about 87,000 in 2018. Disenchantment with city life wasn’t exclusive just to New York City, where the results were most pronounced. Several other cities in the U.S. reported declines as well. For instance, the LA metro area fell by 0.1% and Chicago fell by 0.2%. Pittsburgh and Cleveland also showed nominal drops. LA county posted losses in 2018 due to international migration and more residents leaving. The number of residents in LA county fell 0.1%, to 10.1 million. The county’s population was nearly unchanged in 2017. The new data also shows that international migration into NYC grew slower than previous estimates. Census officials predicted that NYC added an annual average of 78,000 residents from abroad during the period between 2010 to 2017. The actually number turned out to be 54,000 annually. City planning officials have contested this number, however. They claim that a change in how the census counts international migration could be causing this category to be undercounted. They also claim the number could be too low when taking into account the new housing units built over the past few years. Staten Island was the only borough that posted small gains. Queens had the largest drop in 2018, posting 18,000 fewer people. Outside of New York City, the state is seeing a similar exodus, likely helped along by new SALT tax changes. Only two New York counties grew by more than 1,000 people, according to Bloomberg. They were Orange County, with 2,148 residents, faster than any other, and Saratoga, by 1,061. Between April 1, 2010 and July 1, 2018, domestic migration helped see New York post 1.2 million fewer citizens despite foreign immigration and births outnumbering deaths both cushioning the number. Over the past year that data was available – from July 1, 2017 to July 1, 2018 – the state’s population decreased by 48,510. Bitcoin may be a way out, or “an escape hatch,” as put by ShapeShift chief executive and crypto entrepreneur Erik Voorhees. Bitcoin may be the best way to provide people with a lucrative way to prepare for imminent global recession and collapse of the debt-based system. Bitcoin is the sensational decentralized cryptocurrency that could be the answer to central banking – which has caused all of the recessions in the recent past. The economy’s outlook is becoming so horrifying that Ray Dalio, the co-founder of the world’s largest hedge fund, Bridgewater Associates, recently drew eerie parallels between today and the Great Depression. In a comment made at Davos, the world-renowned investor explained that from 1929 to 1932, there was a lot of “printing of money, and purchases of financial assets,” much like today. And he isn’t the only one who thinks we could all live through another depression. Peter Schiff, infamous for his uncanny ability to call the Great Recession before the media’s talking heads did, also believes another Great Depression is coming down the pipes, and this one will be worse than the last. Voorhees took to Twitter to declare that Bitcoin is the answer since economists and central bankers are “no longer pretending” that they could prevent a recession they ignited anyway. This entire system the central banks have crafted for us will all come crashing down at some point, and decentralization will be the key to ensuring it never has to happen again. For all intents and purposes, the overall economy seems to be doing better than ever, just ask the mainstream media. But that’s all happening while certain fiscal and economic indicators aren’t looking all too hot. One of the biggest concerns is the global debt crisis. Debt across the board, especially sovereign debt, is passing all-time highs on a daily basis. In fact, since 2008’s fiscal debacle, the nominal value of all forms of debt has increased by dozens of trillions of dollars, as central banks across the globe bolster their balance sheets, firms borrow more to promote their growth, and consumers spend more than ever, all while lenders are seemingly becoming more lenient with each passing day, wrote NewsBTC. According to Trace Mayer, a long-time advocate for Bitcoin and an anti-centralization free thinker, society has accumulated $87 trillion more debt as humanity’s relentless lust for growth continues, accentuating that governments and society at large haven’t learned from past mistakes. History repeats itself and few on this planet have learned the lessons of the past. The Peterson Foundation, an American financial services group that is focused on amending the nation’s economic issues, stated that the fiscal situation is “not only unsustainable but accelerating.” And the Federal Reserve has been put into “checkmate” by the very system they designed. There isn’t anything they will be able to.